Southstar Communities recognizes that every family and homeowner has different desires for the lifestyles they choose to pursue. And this is precisely why we go to great lengths to offer so many unique and varied locations. 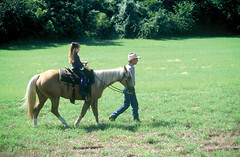 If horseback riding is an interest of yours, discover what Southstar Communities can offer you. Recently, USA Today featured The Bridges at Preston Crossings in Gunter, Texas in an article about affordable ranch living. With an equestrian facility, Fred Couples Signature golf club and many other amentities it is truly a perfect home away from home. Horseback Magazine recently recognized the 9 Best Horse Communities and two of Southstar Communities' properties made the list. Saddle Creek Forest in Magnolia, Texas and King Oaks in Bryan College Station, Texas are considered among the very best in Horseback's vast circulation area. Below is an excerpt from the article, Buying the Perfect Pasture for Your Horse (and a Place to Lay Your Head Too) published in their July 2009 issue. For information on additional horse properties developed by Southstar Communities, click here. The Bridges at Preston Crossings was recently featured in the Star Community Newspapers in an article written by Kim Nguyen. The following is a reprint of the full story, Homebuyers flock to North Texas community. Or visit Star Community Newspapers for the online version. Come to The Bridges Golf Club on Sunday-Friday, June 28-July 3 to watch professional golfers from around the world compete in the Adams Golf Pro Tour Series - Avid Golfer Classic 2009. In 1983, Dallas socialite Myron K. Martin purchased 212 acres of the Double M Ranch including a house from Dallas oilman Bob Franklin. Franklin had used the property as a weekend polo getaway for him and his friends including Prince Albert of Monaco, who scored his first goal at the ranch. At that time, the property was known as Clearfork Ranch. Before becoming the master-planned community it is today, The Bridges was the polo playground for Texas oilman Bob Franklin. Franklin, owner of Costa Resources in West Texas, purchased the Gunter property in the ’70s and titled it Clearfork Ranch. Bob joined Willow Bend Polo Club in Dallas, which was founded by Brinker International’s Norman Brinker, and wanted a place to practice his new interest in polo. Clearfork Ranch quickly became his weekend polo getaway where he could entertain friends including Prince Albert, son of Grace Kelly and now ruler of Monaco. Prince Albert is rumored to have scored his first goal on the property.